Laser skin resurfacing is a laser skin care procedure developed to rejuvenate the skin by minimizing the aging effects of time, sun exposure, and environmental pollutants. The procedure achieves remarkable effects by stripping away damaged outer layers of skin cells to expose the healthy, undamaged layers beneath them. With laser skin resurfacing, it is possible to treat wrinkles, lines, acne scarring, pigmentation problems, and a host of other minor skin imperfections that add up to create the premature appearance of aging. Laser skin resurfacing is an outpatient procedure that takes no more than two hours to complete. Full recovery takes about two weeks. Dr. O’Toole uses only the safest, most advanced treatments, including the ActiveFX™ and DeepFX™ treatments, which are both performed with the UltraPulse® Encore™ Total FX CO2 Laser System made by Lumenis®. There are lots of facial rejuvenation treatments on the market these days, but the gold standard for skin resurfacing remains the CO2 laser. It has been giving great results for years, clocking in high levels of patient satisfaction. 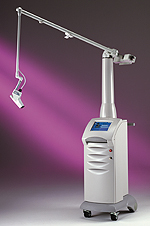 Our UltraPulse® EncoreTM CO2 laser system is, widely regarded as a top-of-the-line system for CO2 laser resurfacing. 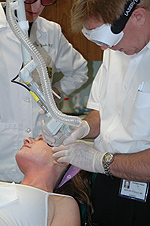 Los Angeles area facial plastic surgeon Dr. Martin O’Toole prefers this laser for its versatility. It has a wide range of settings, providing the kind of finely calibrated control that lets Dr. O’Toole tailor your treatment precisely to your particular skin issues. While removing damage, it also stimulates the formation of new underlying collagen. Over time, the laser’s collagen-stimulating properties will improve your skin’s elasticity and help you retain fullness where you need it, resulting in a more rested, youthful appearance. Collagen resides in the substructure of the dermis, supporting the upper layers. When there isn’t enough of it, you get that tired, drawn look. When restored, healthy collagen adds a certain brightness and radiance to your features. A high-energy beam of CO2 light is sent through a hand piece that Dr. O’Toole gently applies to the surface of your skin. The light vaporizes lines, wrinkles, scars, dark spots and other irregularities, layer by layer. As with all resurfacing techniques, the deeper the penetration, the more efficacious the procedure. Depending on the severity of your skin problems, Dr. O’Toole will choose the appropriate settings and number of times to pass the hand piece over each area. Laser skin resurfacing restores your skin to a healthy state, similar to that of skin that has not experienced sun damage or scarring. 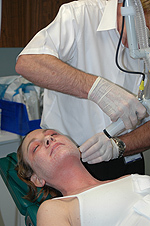 This resurfacing technique is not recommended for darker types of skin since there is a danger of changing the skin pigment. If post-operative care is not followed carefully, then scarring, infection, and color changes can appear. It’s important that you follow Dr. O’Toole’s post-operative instructions to the letter to avoid these complications. The recovery time is approximately two weeks, but you may require up to 30 days’ healing time if you need deeper penetration to address your skin issues. Since this technique causes thermal injury to the skin, Dr. O’Toole will be monitoring your recovery closely. With proper sun protection, results can last for more than five years. In areas where muscle activity is strong, lines may begin to reappear sooner. As skin continues to age at a normal rate, you may want to maintain your results with occasional touch-up resurfacing treatments. While all rejuvenation treatments have different benefits, CO2 laser skin resurfacing is known to be a very thorough treatment for blemished skin. You will find at the end of your healing that you’ve definitively turned back the clock. It is an extremely effective way to undo the damage caused by sun exposure and the passage of time. Please contact Pasadena Cosmetic Surgery today to schedule your complimentary initial consultation. Los Angeles facial plastic surgeon Dr. Martin O’Toole serves patients in Los Angeles, Beverly Hills, and Hollywood, California.